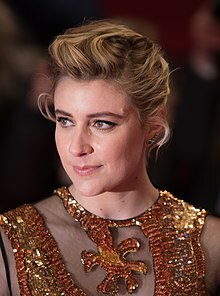 Greta Celeste Gerwig (/ˈɡɜːrwɪɡ/; born August 4, 1983) is an American actress, playwright, screenwriter, and director. She first garnered attention after working on and appearing in several mumblecore films. Between 2006 and 2009, she appeared in a number of films by Joe Swanberg, some of which she co-wrote and co-directed. Since the early 2010s, Gerwig has collaborated with Noah Baumbach on several films, including Greenberg (2010), Frances Ha (2012), for which she earned a Golden Globe Award nomination, and Mistress America (2015). She has also performed in Damsels in Distress (2011), To Rome with Love (2012), Jackie (2016), and 20th Century Women (2016), the latter of which earned her a nomination for the Critics' Choice Movie Award for Best Supporting Actress. In 2017, Gerwig wrote and made her solo directorial debut with the critically acclaimed comedy-drama film Lady Bird, which won the award for Best Motion Picture – Musical or Comedy at the 75th Golden Globe Awards. For her work on Lady Bird, Gerwig also received two Academy Award nominations, for Best Director and Best Original Screenplay, as well as Golden Globe and BAFTA nominations for Best Screenplay. A native of Sacramento, California, Gerwig is the daughter of Christine (née Sauer), an OB-GYN nurse, and Gordon Gerwig, who worked for a credit union on small business loans. She is close to her parents and they make an appearance in Frances Ha as her character's parents. She has an older brother, a landscape architect, and sister, a manager at the Equal Employment Opportunity Commission. She has German, Irish, and English ancestry, and was raised a Unitarian Universalist. She attended St. Francis High School, an all-girls Catholic school in Sacramento. She has described herself as having been "an intense child." She showed an early interest in dance, and had intended to complete a degree in musical theatre in New York, but ended up graduating from Barnard College with a degree in English and philosophy. Outside of class, she performed in the Columbia University Varsity Show with Kate McKinnon. Gerwig originally intended to become a playwright, but turned to acting when she was not admitted to playwriting MFA programs. In 2006, while still studying at Barnard, she was cast in a minor role in Joe Swanberg's LOL, and appeared in Baghead by Jay and Mark Duplass. She began a partnership with Swanberg, which resulted in the duo's co-writing Hannah Takes the Stairs (2007), and sharing both writing and directing duties on Nights and Weekends (2008). Through these films, she became known as a key figure in of the rising mumblecore film movement, often referred to as an "it girl". Although she had an association with a number of other mumblecore filmmakers and appeared in several films, mainstream success remained elusive. Of this period in her life, Gerwig has said "I was really depressed. I was 25 [in 2008] and thinking, 'This is supposed to be the best time and I'm miserable' but it felt like acting was happening for me, and I went back to acting classes." In 2010, Gerwig starred in Noah Baumbach's Greenberg with Ben Stiller, Rhys Ifans, and Jennifer Jason Leigh. In an appraisal of her work in this and other films, The New York Times critic A. O. Scott described Gerwig as an "ambassador of a cinematic style that often seems opposed to the very idea of style." "She seems to be embarked on a project," Scott wrote, "however piecemeal and modestly scaled, of redefining just what it is we talk about when we talk about acting." In 2012, Gerwig appeared in the Woody Allen film To Rome with Love. However, while promoting Lady Bird, Gerwig came under scrutiny for her past work with Allen in 2018. On NPR's Fresh Air, hosted by Terry Gross, she was asked about working with him. Gerwig feared mispeaking about the subject stating, "I think I'm living in that space of fear of being worried about how I talk about it and what I say." She also side-stepped from a similar question after Lady Bird won the Golden Globe Award for Best Motion Picture – Musical or Comedy by stating "(my) job right now I think is to occupy the position of writer and director." After being publicly criticized by Dylan Farrow on Twitter for ignoring her allegations, Gerwig apologized for working with Allen. She elaborated in an interview with The New York Times, saying: "Dylan Farrow's two different pieces made me realize that I increased another woman's pain, and I was heartbroken by that realization. I grew up on his movies, and they have informed me as an artist, and I cannot change that fact now, but I can make different decisions moving forward." Gerwig and Baumbach co-wrote his next film, Frances Ha, which was released in May 2013 after having toured the festival circuit since September 2012. Gerwig played the title role, and received a nomination for the Golden Globe Award for Best Actress – Motion Picture Comedy or Musical for her performance. Her third on-screen collaboration with Baumbach, Mistress America, was released in August 2015 to generally positive reviews. It currently holds an aggregated score of 75 at Metacritic and has an 82% rating at Rotten Tomatoes. Gerwig's next starring role was in Rebecca Miller's Maggie's Plan, which premiered as an official selection of the 2015 Toronto International Film Festival, opening to positive reviews. The film was also screened at the 2016 Sundance Film Festival and the 66th Berlin International Film Festival. That same year, Gerwig starred in Pablo Larraín's Jackie, and Mike Mills' 20th Century Women, earning acclaim for both performances, particularly her work in the latter, for which she earned a nomination for the Critics' Choice Movie Award for Best Supporting Actress. In 2017, Gerwig made her solo directorial debut (after having co-directed Nights and Weekends) with the coming-of-age comedy-drama film Lady Bird, which she also wrote. The film's cast includes Saoirse Ronan, Laurie Metcalf, Tracy Letts, Lucas Hedges, Timothée Chalamet, Beanie Feldstein, Stephen McKinley Henderson, and Lois Smith. Lady Bird premiered at the Telluride Film Festival on September 1, 2017, was theatrically released in the U.S. on November 3, 2017 by A24, and grossed over $78 million against its $10 million budget worldwide. Upon release, Lady Bird was met with widespread critical acclaim, with critics particularly praising Gerwig's screenplay and direction. The film was later chosen by the National Board of Review, the American Film Institute, and Time as one of the top 10 films of 2017. According to the review-aggregation website Rotten Tomatoes, it was given 196 positive reviews in a row, making it the record-holder for the most "fresh" reviews, until the first "rotten" one arrived in December 2017. It currently has a 99% rating on the aforementioned website. At the 75th Golden Globe Awards, Lady Bird won Best Motion Picture – Musical or Comedy and Best Actress – Musical or Comedy for Saoirse Ronan, and also received nominations for Best Supporting Actress for Laurie Metcalf and Best Screenplay for Gerwig. At the 90th Academy Awards, it was nominated for Best Picture, Best Director and Best Original Screenplay for Gerwig, Best Actress for Ronan, and Best Supporting Actress for Metcalf. With the nominations announced, Gerwig had become the fifth woman in history to be nominated for the Academy Award for Best Director. When she found out about the nominations, Gerwig said she was "in various states of laughing and crying and yelling with joy." In 2018, Gerwig was part of the ensemble cast of Wes Anderson's stop-motion animated film Isle of Dogs, which premiered at the 68th Berlin International Film Festival and was nominated for the Academy Award for Best Animated Feature. In late June 2018, it was announced that Gerwig would direct a new film adaptation of Louisa May Alcott's novel Little Women, which she had been previously hired to write, with an ensemble cast including Saoirse Ronan, Emma Watson, Florence Pugh, Eliza Scanlen, Timothée Chalamet, Laura Dern, Meryl Streep, James Norton, Louis Garrel, Bob Odenkirk, Chris Cooper, and Abby Quinn. The film is scheduled to be released on December 25, 2019 by Columbia Pictures. In 2010, Gerwig made her first talk show appearance on Jimmy Kimmel Live!. She later was cast as a lead in the HBO pilot The Corrections in 2011 and a spin-off of How I Met Your Mother titled How I Met Your Dad in 2014, but neither was picked up to series. Gerwig voiced one of the main characters in the Adult Swim animated series China, IL. In 2016, she guest-starred in two episodes of the comedy series The Mindy Project. In May 2014, Gerwig made her stage debut as Becky in Penelope Skinner's The Village Bike at the Lucille Lortel Theatre in New York. The show ran until the end of June. She was nominated for the Outer Critics Circle Award for Best Actress for her performance. In 2011, Gerwig won an award from the Athena Film Festival for her artistry as one of Hollywood's definitive screen actresses of her generation. In 2014, she was selected as a member of the jury for the 64th Berlin International Film Festival. In 2018, her nomination for Best Director at the 90th Academy Awards for Lady Bird made her the first woman in eight years (and one of only five women in Oscar history) to have been nominated in that category. Gerwig's work on Lady Bird was nominated for sixteen awards in notable circuits, winning six of those awards. In July 2017, Gerwig was among sixty artists who signed an open letter organized by the New York-based group Adalah-NY that called on Lincoln Center to cancel performances of a play by Israeli author David Grossman staged "with support of the Israel's Office of Cultural Affairs in North America." In September 2017, Gerwig apologized, saying signing the letter had been "a mistake. I was unfamiliar with the complexities of the letter and I did not take the time to study them." Gerwig's films tend to be based on her own experiences. In a behind-the-scenes video on the set of Lady Bird she said, "I tend to start with things from my own life, then pretty quickly they spin out into their own orbit." Gerwig presses her actors to incorporate who they are personally into their performances as well, and says of her writing and directing, "it's all about actors." In addition, she allows little line improvisation and the script is followed fairly closely. Her works have common themes: the growth and emotional maturation of the leading woman, and relationships among family members, friends, and significant others, with a special interest in female dynamics. Characters are reportedly never villainized, and all are sympathetic. She tends to imbue her films with a unique and specific deadpan sense of humor. Visually they also carry a very specific atmosphere – simultaneously having the warmth of looking back on something in memory and displaying things as they are, stripped of any sort of showiness. Gerwig moved to New York City at 19 to attend Barnard College. She now lives in Brooklyn with writer-director Noah Baumbach, her partner since late 2011. In March 2019, it was announced Gerwig and Baumbach had welcomed a son. 2015 Portlandia Mermaid Episode: "Doug Becomes a Feminist"
2017 Saturday Night Live Ms. Reynolds (Uncredited) Episode: "Saoirse Ronan/U2"
^ "Noah Baumbach & Greta Gerwig - Personal Palace Cinemas Introduction". Palace Cinemas. August 13, 2015. Retrieved May 7, 2018. ^ Heyman, Stephen (January 28, 2010). "The Nifty 50 | Greta Gerwig, Actress". The New York Times. T Magazine. Retrieved March 15, 2010. ^ Rosen, Christopher (February 9, 2009). "Noah Baumbach Hires Mumblecore's Meryl Streep, Readies Greenberg". The New York Observer. Retrieved March 15, 2010. ^ a b Bunbury, Stephanie (July 19, 2013). "Real to reel: The rise of 'mumblecore'". The Sydney Morning Herald. Retrieved January 9, 2018. ^ a b Larocca, Amy (March 7, 2010). "Sweetheart of Early-Adult Angst". New York Magazine. Retrieved January 9, 2018. ^ a b Eisner, Ken (June 20, 2013). "Mumblecore queen Greta Gerwig laughs last in Frances Ha". The Georgia Straight. Retrieved January 9, 2018. ^ a b Thompson, Anne (December 21, 2016). "'20th Century Women': How Mike Mills Empowered Annette Bening and Greta Gerwig". IndieWire. Retrieved March 2, 2018. ^ Hammond, Pete (December 1, 2016). "'La La Land' Grabs Massive 12 Nominations To Lead All Movies In Critics' Choice Awards". Deadline Hollywood. Retrieved December 1, 2016. ^ a b c Gonzalez, Sandra (February 26, 2018). "Greta Gerwig's 'Lady Bird' best director nomination is a huge deal". CNN. Retrieved March 2, 2018. ^ a b c d Smallwood, Christine (November 1, 2017). "Greta Gerwig's Radical Confidence". The New York Times. ISSN 0362-4331. Retrieved November 1, 2017. ^ "Greta Gerwig Is Sorry Her Little Brother Didn't Get to Watch How I Met Your Dad". Vanity Fair. September 7, 2014. Retrieved September 7, 2014. ^ Adams, Guy (April 16, 2011). "Greta Gerwig: The queen of low-budget cinema is breaking into the mainstream with her role in Arthur". The Independent. Retrieved May 24, 2013. ^ Littleton, Cynthia (August 15, 2013). "Greta Gerwig, UU film star". UU World. Retrieved August 20, 2013. ^ Adams, Thelma (June 22, 2012). "'To Rome With Love' star Greta Gerwig is wild about Woody Allen — just read her high school yearbook". Yahoo! Movies. Retrieved January 19, 2013. ^ a b c d Brockes, Emma (July 13, 2013). "Greta Gerwig: daydream believer". The Guardian. Retrieved July 16, 2013. ^ "Hannah Takes The Stairs". Retrieved February 21, 2015. ^ Vinciguerra, Thomas (Spring 2014). "Varsity Show Endears and Endures | Columbia College Today". Columbia University. Retrieved January 31, 2017. ^ Olsen, Mark (July 26, 2008). "The accidental 'It' girl". Los Angeles Times. ISSN 0458-3035. Retrieved January 9, 2018. ^ Punter, Jennie (June 15, 2012). "Lola Versus: Indie It girl Greta Gerwig still has it". The Globe and Mail. Retrieved January 9, 2018. ^ Scott, A. O. (March 24, 2010). "No Method To Her Method". The New York Times. Retrieved May 24, 2013. ^ a b Rosen, Christopher; Romano, Nick (January 10, 2018). "Greta Gerwig regrets working with Woody Allen". Entertainment Weekly. Retrieved March 2, 2018. ^ "Greta Gerwig side steps Woody Allen question at Golden Globes". 96 news HD. January 8, 2018. Retrieved January 8, 2018. ^ Bruni, Frank; Gerwig, Greta; Sorkin, Aaron (January 9, 2018). "Greta Gerwig, Aaron Sorkin: Hollywood Must Change". The New York Times. ISSN 0362-4331. Retrieved March 2, 2018. ^ Strecker, Erin (December 12, 2013). "Golden Globes: 'Frances Ha' star Greta Gerwig is 'just very happy right now. I can't make sense!'". Entertainment Weekly. Retrieved November 3, 2017. ^ "Mistress America". Metacritic. Retrieved April 13, 2016. ^ "Mistress America". Rotten Tomatoes. Retrieved March 8, 2019. ^ Kay, Jeremy (July 28, 2015). "Toronto to open with 'Demolition'; world premieres for 'Trumbo', 'The Program'". Screen Daily. Retrieved February 19, 2016. ^ Harvey, Dennis (September 12, 2015). "Sundance Film Review: 'Maggie's Plan'". Variety. Retrieved February 19, 2016. ^ Lawson, Richard (September 13, 2015). "Julianne Moore Shows Off Her Delightful Comedy Chops in Maggie's Plan". Vanity Fair. Retrieved February 19, 2016. ^ Smith, Nigel M. (September 13, 2015). "Maggie's Plan review: Julianne Moore steals agreeably messy comedy". The Guardian. ISSN 0261-3077. Retrieved February 19, 2016. ^ Kroll, Justin (October 30, 2015). "Greta Gerwig Joins Natalie Portman in 'Jackie' (EXCLUSIVE)". Variety. Retrieved February 12, 2017. ^ McNary, Dave (May 14, 2015). "Annette Bening, Greta Gerwig, Elle Fanning Join '20th Century Women'". Variety. Retrieved February 12, 2017. ^ Fleming Jr, Mike (August 7, 2015). "Greta Gerwig To Direct Her Script 'Lady Bird' For IAC Films". Deadline Hollywood. Retrieved April 13, 2016. ^ N'Duka, Amanda (September 7, 2016). "John Karna Joins 'Lady Bird' Bevy; Natasha Liu Bordizzo Checks Into 'Hotel Mumbai'". Deadline Hollywood. Retrieved September 8, 2016. ^ McCarthy, Todd (September 5, 2017). "'Lady Bird': Film Review | Telluride 2017". The Hollywood Reporter. Retrieved September 8, 2017. ^ Debruge, Peter (September 4, 2017). "Telluride Film Review: Saoirse Ronan in 'Lady Bird'". Variety. Retrieved September 8, 2017. ^ a b "National Board of Review Announces 2017 Award Winners". National Board of Review. November 28, 2017. Retrieved December 7, 2017. ^ "Greta Gerwig Biography". Biography.com. Retrieved March 8, 2019. ^ Sharf, Zack (December 11, 2017). "'Lady Bird' No Longer Has a Perfect 100% on Rotten Tomatoes (and Nobody is Happy About It)". IndieWire. Retrieved December 11, 2017. ^ "Lady Bird". Rotten Tomatoes. Retrieved March 8, 2019. ^ Cord-Cruz, Nicole (January 23, 2018). "Greta Gerwig can't stop crying about "Lady Bird's" Oscar nominations, and the feelings are real". HelloGiggles. Retrieved January 23, 2018. ^ Meza, Ed (February 15, 2018). "Berlin Opening Night: Wes Anderson, Tilda Swinton, Greta Gerwig Celebrate 'Isle of Dogs'". Variety. Retrieved March 2, 2018. ^ Sharf, Zack (June 29, 2018). "Director Greta Gerwig Eyeing 'Little Women' With Saoirse Ronan, Timothée Chalamet, Emma Stone, and Meryl Streep". IndieWire. Retrieved June 29, 2018. ^ Spencer, Perry (August 24, 2018). "Emma Watson Replacing Emma Stone in Sony's Little Women Movie". ComingSoon.net. Retrieved August 24, 2018. ^ Galuppo, Mia (August 14, 2018). "Laura Dern in Talks to Join Meryl Streep in 'Little Women' (Exclusive)". The Hollywood Reporter. Retrieved August 26, 2018. ^ N'Duka, Amanda (September 5, 2018). "Louis Garrel Cast In 'Little Women' Movie At Sony". Deadline Hollywood. Retrieved September 6, 2018. ^ N'Duka, Amanda (September 28, 2018). "'Better Call Saul's Bob Odenkirk Joins Greta Gerwig's 'Little Women' Remake". Deadline Hollywood. Retrieved October 1, 2018. ^ Pederson, Erik (July 18, 2018). "Sony Moves Tarantino's Manson Pic, Dates 'Zombieland 2' & 'Little Women'". Deadline Hollywood. Retrieved July 18, 2018. ^ Andreeva, Nellie (February 11, 2014). "Greta Gerwig To Topline CBS' 'How I Met Your Mother' Spinoff - Deadline". Deadline Hollywood. Retrieved February 21, 2015. ^ Malone, Noreen (October 31, 2017). "Greta Gerwig Is a Director, Not a Muse". Vulture. Retrieved October 31, 2017. ^ Bacle, Ariana (March 18, 2016). "Greta Gerwig to guest-star on The Mindy Project". Entertainment Weekly. Retrieved June 28, 2016. ^ "The Village Bike - Off-Broadway Tickets - Broadway - Broadway.com". Broadway.com. Retrieved February 21, 2015. ^ "The Village Bike - Lortel Archives". Lortel Archives. Retrieved January 31, 2017. ^ "2011 Athena Award Winners". Athena Film Festival. Retrieved November 8, 2017. ^ "James Schamus Will Head Berlin Jury That Includes Christoph Waltz, Greta Gerwig and Michel Gondry". IndieWire. January 14, 2014. Retrieved January 14, 2014. ^ "Oscars 2018: Greta Gerwig gets first female director nomination in eight years". Sky News. January 23, 2018. Retrieved February 22, 2018. ^ Wicks, Amanda (January 8, 2018). "Golden Globes 2018: Lady Bird Wins Best Motion Picture, Musical or Comedy". Pitchfork. Retrieved March 5, 2018. ^ Lewis, Hilary (January 6, 2018). "'Lady Bird' Named Best Picture by National Society of Film Critics". The Hollywood Reporter. Retrieved January 8, 2018. ^ Deb, Sopan (July 5, 2017). "Artists Protest Lincoln Center Play Backed by Israel". The New York Times. Retrieved July 5, 2017. ^ Spiro, Amy (July 6, 2017). "Artists protest Israeli-gov't sponsored play in New York". The Jerusalem Post. Retrieved July 6, 2017. ^ Smith, Emily; Mohr, Ian (September 29, 2017). "Greta Gerwig regrets signing letter against Israeli-backed play". New York Post. Retrieved September 29, 2017. ^ Friedman, Gabe (October 5, 2017). "Actress Greta Gerwig regrets signing Israel boycott letter". The Times of Israel. Retrieved October 5, 2017. ^ Olsen, Mark (September 7, 2012). "'Frances Ha' bonds Noah Baumbach, Greta Gerwig". Los Angeles Times. Retrieved May 24, 2013. ^ Parker, Ian (April 29, 2013). "Happiness". The New Yorker. Retrieved May 24, 2013. ^ Cohen, Jess (March 20, 2019). "Surprise! Greta Gerwig and Noah Baumbach Welcomed Their First Child". E! News. Retrieved March 20, 2019. ^ Marcus, Emily (March 20, 2019). "Greta Gerwig and Boyfriend Noah Baumbach Secretly Welcome Baby Boy". US Weekly. Retrieved March 20, 2019.